The poll in Fairfax newspapers shows the Coalition has boosted its two-party lead over Labor by two points to 57-43 per cent. It also shows Opposition Leader Tony Abbott has gone further ahead as preferred prime minister, leading Ms Gillard 46-42 per cent - last month they were neck and neck. 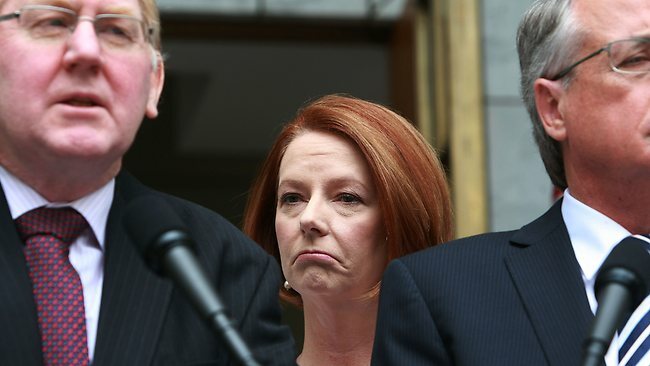 Ms Gillard's approval rating fell by four points to 35 per cent. Her party's primary vote has weakened a point to 29 per cent while the Coalition's has gone up four points to 49 per cent. Meanwhile Gillard's cabinet re-shuffle is looking like re-arranging the chairs on the Titanic. JULIA Gillard will today announce a ministerial reshuffle promoting Assistant Treasurer Bill Shorten, as she moves to inject fresh blood into an expanded cabinet and increase the focus on key economic and social policy priorities. The Prime Minister yesterday discussed key portfolio positions in a series of telephone calls with senior ministers as she moved to reshape her line-up for next year. The reshuffle was triggered by Small Business Minister Nick Sherry telling Ms Gillard at the ALP National Conference that he wanted to step down from the ministry for personal reasons. Ms Gillard has taken the opportunity to canvass a wider revamp of the frontbench. Of course all this is happening with complete disregard for the wishes of the electorate which was conned into voting for Juliar, based on the lie that there wouldn't be any Carbon Tax. Juliar thinks this is an autocracy. Her and PM Brown will find out that it's not, at the next elections.